It is 1947, and Orson Welles - famed star of film, theatre, and radio, is on the verge of defecting to Europe from America. Abandoned by the very elite that created him, he takes to the stage one last time to reveal the truth behind his meteoric rise to fame, and his spectacular fall from grace. Blake Erickson ([title of show], Floyd Collins, A New Brain) returns as Orson Welles, a performance that won him the Sydney Fringe Award for Best Performance and a Sydney Festival Independent Artist Prize nomination. Directed by Sarah Blackstone (Spring Awakening, Ruby Moon), and produced by Neil Gooding (The Hatpin), Pearls Before Swine: An Evening With Orson Welles plays from Friday January 20th - Saturday January 21st. 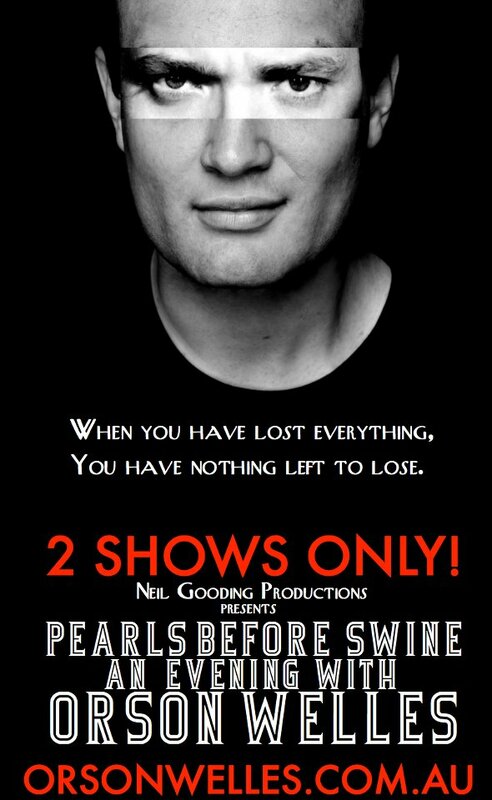 Pearls Before Swine: An Evening With Orson Welles, the biggest hit of the inaugural Sydney Fringe Festival is back for two shows only at Sydney's Sidetrack Theatre, Marrickville. The one-man play gives audiences the opportunity to spend an evening with one of the twentieth centuries most enigmatic and engaging figures - Orson Welles, the director of 'Citizen Kane' and creator of the radio broadcast that terrified a nation, 'The War of the Worlds'. Pearls Before Swine will return to the Sydney Fringe Festival in 2012 for two very special performances, before heading off to perform a Melbourne season in October 2012. "Whisky with Welles slides down smoothly on debut!" "The actor Blake Erickson may have drought-proofed his career with his first play Pearls Before Swine....this quality one-man vehicle can - and should - play widely." "Whisky in hand, Welles (Erickson) charms the audience. Erickson has a melliflous voice and natural gravitas"
"The kind of theatrical gem that is a pleasure to come across"
"A charismatic and engrossing performer"
"Pulling impressive double duty as both writer and performer is Blake Erickson...who conveys not only a believable physical embodiment of Welles, but moreover creates a striking vocal recreation"